2. The EP capsule is supplied with plenty of Aluminium lids, specially designed for ease of use and protection of the capsule gasket for a longer life as well as protecting your machine. Never use cheaper Aluminium lids, it will slowly damage the machine and gaskets. 4. 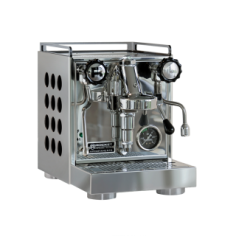 Use coffee from EP that is specifically ground for the capsules , the capsules needs coarser grinding than traditional espresso machines. Use the spoon bottom for very light tamping after filling, the capsule should be full to the top. If the flow during brewing is dripping or blocked, this means grinding is too fine or tamping was too hard. 5. Use 2 capsules simultaneously for a double shot, the EP capsule is designed to accommodate 5.5 g of coffee, and this quantity is for a single shot. 6. The EP capsule is made of the best quality stainless steel used for food and pharmaceuticals, it does not stain, rust or react with the coffee and will last for very long time.